Joe Wood has big dreams. He wants to be a newspaperman, and though he's only thirteen, he's already borrowed money for the equipment to start his own press. But it's April 1861, and the young nation is teetering on the brink of a civil war. He has to help Owen, his young assistant, deal with the challenges of being black in a white world torn apart by color. He needs to talk his best friend, Charlie, out of enlisting. He wants to help a young spiritualist, Nell, whose uncle claims can she speak to the dead. And when Owen disappears, it's up to Joe to save him. Lea Wait skillfully draws on the lives of real people in Maine's history to tell this story of three young adults touched by war and the tensions it brings, forcing them into adulthood before they may be ready. This is an excellent historical fiction book based on actual events and people. It is the story of fourteen-year-old Joe and his newspaper. Joe decides to publish a weekly newspaper for his small Maine town. It’s April 1861 in the small town of Wiscasset, Maine, and ambitious fourteen-year-old Joe Wood has a problem. He owes money to his local newspaper, the Wiscasset Herald. It’s April, 1861 and the civil war is right around the corner. Joe Wood is a young newspaper man. At the age of 14, he runs the Wiscasset Gazette with the help of his young assistant, Owen, and his older best friend Charlie. Joe has three weeks to repay his debt of $23 or he loses the Gazette. But Joe isn’t the only one with problems, not counting the debt he has to repay. Joe is trying to keep Charlie from enlisting. 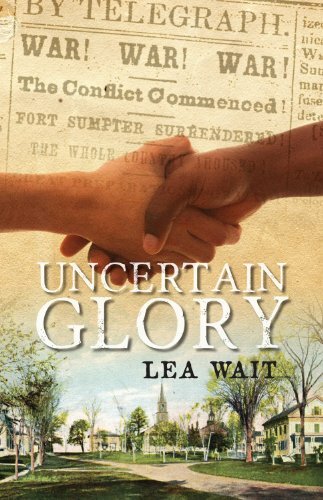 Uncertain Glory is an amazing story inspired by true events. Joe Wood is the main character of the story. In this captivating tale, Joe must earn enough money to pay back a man who lent him cash so he could begin a printing press. Amid the chaos of the U.S. Civil War and the opinionated war of white men vs. black, Joe must help his African friend, Owen. In Uncertain Glory, the main character is a 13 year-old boy named Joe Wood. Joe is a boy who owns his own newspaper printing shop during the Civil War. Charlie, Joe's best friend, helps him in the shop, but Joe is scared because if he doesn't pay back Mr. Allen, he will take all his printing machines back that he loaned Joe. Joe is really scared that he won't be able to pay his debt for them, so he works super hard. He also meets and becomes friends with a girl named Nell, and she can communicate with spirits. It’s the year 1861. Joe Wood is a fourteen-year-old in the village of Wiscasset, Maine. With his big dreams of becoming a newspaperman, he has started writing his own newspaper, the Wiscasset Herald, by borrowing sixty-five dollars from Mr. Shuttersworth. With the help of his assistant Owen, Joe tries to raise the sixty-dollars he owes him. But with the Revolutionary War just around the corner and Owen struggling with being made fun of for being black in a white community, he doesn’t know if he’ll be able to save his newspaper business. It’s the year 1861. Joe Wood is a fourteen year old in the village of Wiscasset, Maine. With his big dreams of becoming a newspaperman he has started writing his own newspaper, the Wiscasset Herald, by borrowing sixty-five dollars from Mr. Shuttersworth. With the help of his assistant Owen, Joe tries to raise the sixty-dollars he owes him. But with the Revolutionary War just around the corner, and Owen struggling with being made fun of for being black in a white community, he doesn’t know if he’ll be able to save his newspaper business. But when the strange young girl, Nell Gramercy, and her uncle and aunt come to town everything changes.